A personal finance blog that provides historical perspective, emphasizes strategic planning, and uses graphs & spreadsheets to show how financial things work. The Dow started the month closing higher 10 straight days. 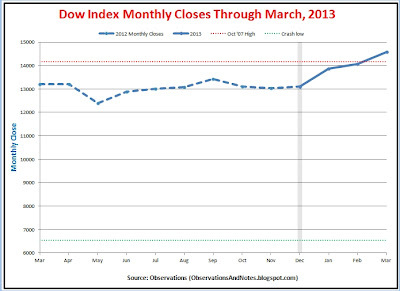 The close on March 5 finally established a new all-time high. So, slightly more than four years after the crash low, the Dow surpassed the October '07 high of 14,165. Obviously, the remaining closes in the 10-day string also set new all-time highs. Finally, to finish off the month in style, on the last trading day of the month the S&P 500 finally eclipsed its October '07 high as well, closing at 1569.19. Both the Dow and the S&P 500 closed the first quarter up more than 10%. Here's where we stand vs some key dates and milestones. 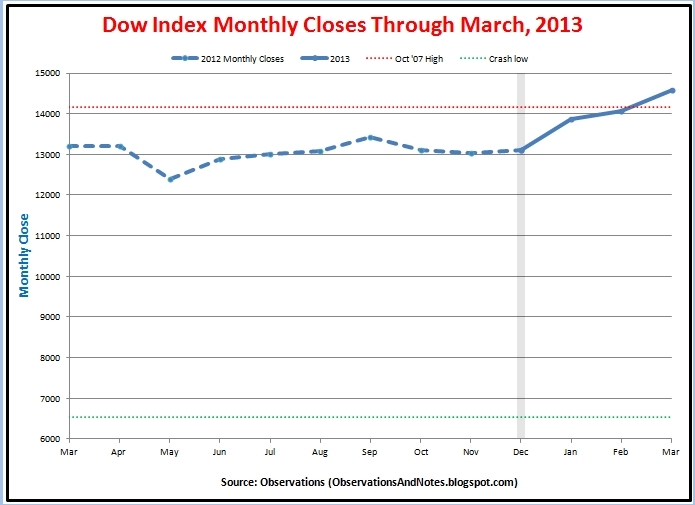 From One Year Ago Close of 13,212 at end of March, 2012: the Dow is up 1367 points ( 10.3%). For other related results, see February 2013 stock market results. Note: At the end of the crash, the Dow had lost about 54% of its value (from the pre-crash high). For an explanation of how it can be up over 120% since then and still be barely above the pre-crash high, see The Importance of Avoiding Large Losses. My model for projecting 10-year stock market returns is currently projecting 10-year returns below 4.5%. Since my model is earnings based, this is a preliminary number. I'll have to wait for 2012 earnings data before finalizing the projection. I expect to post the "official" update later this month. U.S. Treasury constant maturity interest rates were virtually unchanged from last month. Five year treasury yields were 0.77% at the end of both months; ten year yields decreased very slightly from 1.89% to 1.87%. My interest rate forecasting model continues to forecast increasing rates over the next five years. That model forecasts 1-year rates rising from the current 0.14% to 2.19% (down from 2.25% last month), and 5-year rates rising from 0.77% to 2.98% (down from 3.02% last month). 100 Years of Stock Market History: Bigger perspective on "Where are we now?" Includes 100-year chart and discussion of the long flat periods. 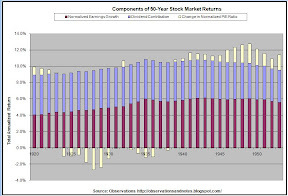 What has the range of returns (minimum & maximum) been for 1,2, 3, ... 100-year periods? 10-Year Stock Market Projection The most recent "official" projection. Comparison of projections to actuals. 100 Years of Interest Rate History: graph of Treasury Note interest rates since 1900.
Who's Afraid of a Sideways Market? : Interesting perspective on long flat periods from Morningstar. Why Fund Investors Earn Lower Returns Than the Funds They Own(! ): the impact of timing. For lists of other popular posts and an index of stock market posts, by subject area, see the sidebar to the left or the blog header at the top of the page. Bookmark this on Delicious To share via Facebook, Twitter, etc., see below. Nice blog, I'm surprised I have not come across your blog sooner. Ditto. What a lot of interesting material. No spam, please! Comment spam will not be published. See comment guidelines here. Sorry, but I can no longer accept anonymous comments. They're 99% spam. How Much Will You Receive in Social Security Benefits? What Will $100 be Worth in 10-20 Years? How Much Should You Have in Savings? What Would $10,000 in 19xx be Equivalent to Today? What Will $100 be Worth in 10 - 20 Years? How Much Would $1 Invested in the Stock Market in 19xx be Worth Now? What Would $1 Invested in 19xx be Worth Now? What Will a $10,000 Investment be Worth in 20 Years? How Much Will You Receive in Social Security Income? What % of Income Should High-Income Earners Save? What Will My Bond/CD be Worth in 10 Years? What Will My Bond/CD be Worth in 5 Years?